Strabismus is a condition in which the eyes do not point in the same direction. It can also be referred to as a tropia or squint. Strabismus is equally common in boys and girls. It sometimes runs in families. Esotropia is the most common type of strabismus in infants. Accommodative esotropia develops in children under age two who cross their eyes when focusing on objects nearby. This usually occurs in children who are moderately to highly farsighted (hyperopic). Another common form of strabismus, exotropia, may only be noticeable when a child looks at far-away objects, daydreams, or is tired or sick. Sometimes the eye turn is always in the same eye; however sometimes the turn alternates from one eye to the other'. Most children with strabismus have comitant strabismus. No matter where they look, the degree of deviation does not change. In incomitant strabismus, the amount of misalignment depends upon which direction the eyes are pointed. This condition, false strabismus, usually disappears as the child's face grows. An eye doctor needs to determine whether the eyeturn is true or pseudostrabismus. With normal vision, both eyes send the brain the same message. This binocular fixation (both eyes looking directly at the same object) is necessary to see three-dimensionally and to aid in depth perception. When an eye is misaligned, the brain receives two different images. Young children learn to ignore distorted messages from a misaligned eye, but adults with strabismus often develop double vision (diplopia). A baby's eyes should be straight and parallel by three or four months of age. 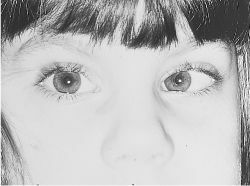 A child who develops strabismus after the age of eight or nine years is said to have adult-onset strabismus. Diseases that cause partial or total blindness can cause strabismus. So can extreme farsightedness, cataracts, eye injury, or having much better vision in one eye than the other. The most obvious symptom of strabismus is an eye that isn't always straight. The deviation can vary from day to day or during the day. People who have strabismus often squint in bright sunlight or tilt their heads to focus their eyes. Every baby's eyes should be examined by the age of six months. A baby whose eyes have not straightened by the age of four months should be examined to rule out serious disease. A pediatrician, family doctor, ophthalmologist, or optometrist licensed to use diagnostic drugs uses drops that dilate the pupils and temporarily paralyze eye-focusing muscles to evaluate visual status and ocular health. Early diagnosis is important. Some eye turns may be a result of a tumor. Untreated strabismus can damage vision in the unused eye and possibly result in lazy eye (amblyopia). Early consistent treatment usually improves vision and appearance. The most satisfactory results are achieved if the condition is corrected before the age of seven years old. American Academy of Pediatric Ophthalmology and Strabismus (AAPOS). 〈http://med-aapos.bu.edu〉. deviation of the eye that the patient cannot overcome; the visual axes assume a position relative to each other different from that required by the physiological conditions. Called also squint. adj., adj strabis´mic. The various forms of strabismus are spoken of as tropias, their direction being indicated by the appropriate prefix, as cyclotropia, esotropia, exotropia, hypertropia, and hypotropia. During the first 3 to 6 months of life, the eyes of infants tend to waver and turn either inward or outward independently of one another; this usually corrects itself. If it persists, or if the eyes are continually crossed in the same way, even if the child is less than 6 months old, it may be a sign of strabismus. Children do not outgrow strabismus. In an older child, a tendency to tilt the head when reading, or to close or rub one eye, may indicate strabismus. Strabismus almost always appears at an early age. If not corrected, the condition may impair vision in the nonfocusing eye, as well as marring the child's appearance. In the great majority of cases the eyes can be straightened by proper medical treatment at any age, but vision of the malfunctioning eye may remain impaired. If treated early enough, preferably before 6 years, normal vision can usually be restored in the affected eye. Cause. Strabismus may result from several factors, including a blow on the head, disease, or heredity. Many cases are caused by a malfunction of the muscles that move the eyes. This causes the eyes to focus differently, sending different images to the brain. As the child grows, he or she learns to ignore the image from one eye with the result that it fails to grow as strong as the eye on which he or she is depending. Treatment. Treatment for strabismus varies with the individual case. A patch may be placed over the child's stronger eye for a period, forcing use of the weaker eye and thus restoring its strength as far as possible, instead of letting it grow worse from lack of use. Eyeglasses or special eye exercises may correct the condition. In some cases, a relatively simple surgical operation on the eye muscles may be necessary. Since these muscles are outside the eye itself, there is no danger to the vision. comitant strabismus (concomitant strabismus) that in which the angle of deviation of the visual axis of the squinting eye is always the same in relation to the other eye, no matter what the direction of the gaze; due to faulty insertion of the eye muscles. noncomitant strabismus (nonconcomitant strabismus) that in which the amount of deviation of the squinting eye varies according to the direction in which the eyes are turned. vertical strabismus that in which the visual axis of the squinting eye deviates in the vertical plane; see hypertropia and hypotropia. A manifest lack of parallelism of the visual axes of the eyes. concomitant strabismus that due to faulty insertion of the eye muscles, resulting in the same amount of deviation regardless of the direction of the gaze. nonconcomitant strabismus that in which the amount of deviation of the squinting eye varies according to the direction of gaze. vertical strabismus that in which the visual axis of the squinting eye deviates in the vertical plane (hypertropia or hypotropia). A visual defect in which one eye cannot focus with the other on an object because of imbalance of the eye muscles. Also called squint. stra·bis′mal (-məl), stra·bis′mic (-mĭk) adj. an abnormal ocular condition in which the visual axes of the eyes are not directed at the same point. There are two kinds of strabismus, paralytic and nonparalytic. Paralytic strabismus results from the inability of the ocular muscles to move the eye because of neurologic deficit or muscular dysfunction. 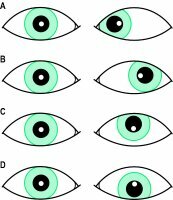 The muscle that is dysfunctional may be identified by watching as the patient attempts to move the eyes to each of the cardinal positions of gaze. If the affected eye cannot be directed to a position, the examiner infers that the associated ocular muscle is the dysfunctional one. Because this kind of strabismus may be caused by tumor, infection, or injury to the brain or the eye, an ophthalmologic examination is recommended. Nonparalytic strabismus is a defect in the position of the two eyes in relation to each other. The condition may be inherited. The person cannot use the two eyes together but has to fixate with one or the other. The eye that looks straight at a given time is the fixing eye. Some people have alternating strabismus, using one eye and then the other; some have monocular strabismus, which affects only one eye. Visual acuity diminishes with diminished use of an eye, and suppression amblyopia may develop. Nonparalytic strabismus and suppression amblyopia are treated most successfully in early childhood. The primary treatment to prevent amblyopia consists mainly of covering the fixing eye, forcing the child to use the deviating eye. The earlier it is begun, the more rapid and effective is the treatment. The eyes might be straightened by surgery, but suppression amblyopia will not be corrected. Also called squint. See also anoopsia, esotropia, exotropia. strabismal, strabismic, strabismical, adj. Nonparallel positioning or movement of the eyes—usually of the vertical axis—due to decreased binocular muscle coordination with loss of stereoscopic vision and inability to focus simultaneously on a single point. Extraocular muscle defects, neurotoxins, blindness, mechanical defects, unilateral vision obstruction in childhood, various brain disorders or systemic diseases, amblyopia, paralytic shellfish poisoning, botulism, haemangioma near eye, Guillain-Barré syndrome, Apert syndrome, Noonan syndrome, Prader-Willi syndrome, trisomy 18, congenital rubella, incontinentia pigmenti, cerebral palsy, Laurence-Moon-Biedl syndrome, pseudohyperparathyroidism. Crossed eyes; exotropia, walleye Ophthalmology Nonparallel position or movement of eyes, due to ↓ muscle coordination between eyes, with loss of stereoscopic vision and inability to focus simultaneously on a single point Etiology Extraocular muscle defects, neurotoxins, blindness, mechanical defects, unilateral vision obstruction in childhood, various brain disorders or systemic diseases, amblyopia, paralytic shellfish poisoning, botulism, hemangioma near eye, Guillain-Barre´ syndrome, Apert syndrome, Noonan syndrome, Prader-Willi syndrome, trisomy 18, congenital rubella, incontinentia pigmenti, cerebral palsy, Laurence-Moon-Biedl syndrome, pseudohyperparathyroidism. See Farsightedness, Myopia. Synonym(s): crossed eyes, cross-eye, heterotropia, heterotropy, squint (1) . Squint. The condition in which only one eye is aligned on the object of interest. The other eye may be directed too far inward (convergent strabismus), too far outward (divergent squint), or upward or downward (vertical squint). Squint in childhood, or any squint of recent onset, requires urgent treatment. Untreated childhood squint often leads to AMBLYOPIA. New squints in adults usually imply a disorder of the nervous system. Synonym(s): crossed eyes, heterotropia, squint (1) . n an abnormal ocular condition in which the eyes are crossed. deviation of the eye that the patient cannot overcome; the visual axes assume a position relative to each other different from that required by the physiological conditions. Called also squint. extraocular muscles are not paralyzed and the degree of deviation is the same in all directions. medial strabismus is seen in Siamese cats. See convergent strabismus (below). that in which the visual axes converge; esotropia, or cross-eye. A frequent finding in Siamese cats, related to an anomaly of neuronal pathways between the retina and lateral geniculate nucleus in which more neurons project contralaterally rather than ipsilaterally as in other cats. that in which the visual axes diverge; called also exotropia and walleye. deviation due to paralysis of one or more muscles. a complication of traumatic prolapse of the eye, due to rupture of extraocular muscles.